Buy New Samsung 60mm f/2.8 Macro ED OIS NX Lens Malaysia At FotoZZoom! This i-Function lens is perfect for novices and experts alike. If you’re a beginner, shoot confidently like a pro with Lens Priority Mode. 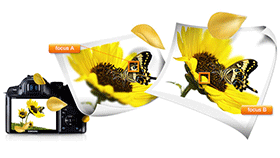 This allows your camera to instantly recognize the type of lens you’ve attached. Now, it will serve up optimal scene modes with i-Scene, while i-Setting optimizes all the settings for the perfect shot. If you’re already a pro, you can cycle through and adjust shutter speed, aperture, ISO and more ? all without taking your fingers off the lens, and your eyes off the shot ? simply by pressing the i-Function button and turning the value ring to the desired settings. Here’s a lens ready for its close-up: the Samsung 60mm macro lens. It comes equipped with a supersonic actuator for fast, silent and precise auto focusing ? 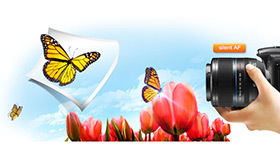 perfect for the amateur entomologist looking to capture an amazing image of a fluttering butterfly. And thanks to its internal focusing system, the lens barrel remains fixed. So you can get right up close to your tiny little subjects without startling them and capture stunning details that can’t be seen with the naked eye. The lens autofocus (AF) mechanism sets you up for the perfect shot every time, but sometimes, it’s just not the perfect shot you wanted. The Samsung 60mm macro lens allows full-time manual focus in AF mode; so, you can quickly fine-tune your shot without having to switch modes. This gives you instant and total control over what to focus on and what to blur out in your macro shots. Create beautiful images that move you, even if you jostle the camera. The 60 mm macro lens comes equipped with lens-shift optical image-stabilizing technology. 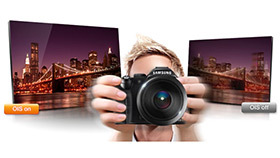 Samsung’s optical image stabilizer uses tiny lens-shifts to cancel out motion blur, even in low exposure shots. And since the image is being stabilized externally in the lens, what you see through the viewfinder ? and on the display ? is perfectly clear.